Patrons of the Barbados Welfare Department and pediatric patients of the Queen Elizabeth Hospital will have a slightly merrier holiday season, following a donation of children’s gifts from Banks Holdings Limited (BHL) staff. Dozens of wrapped presents were donated to the two facilities during December for distribution on Christmas Day. The initiative was conceptualized by the company’s People Department. People Manager Banks (Barbados) Breweries Ltd. (BBBL), Gracelyn Barker, says staff members wanted to ensure that the most vulnerable in the community had a happy Christmas. 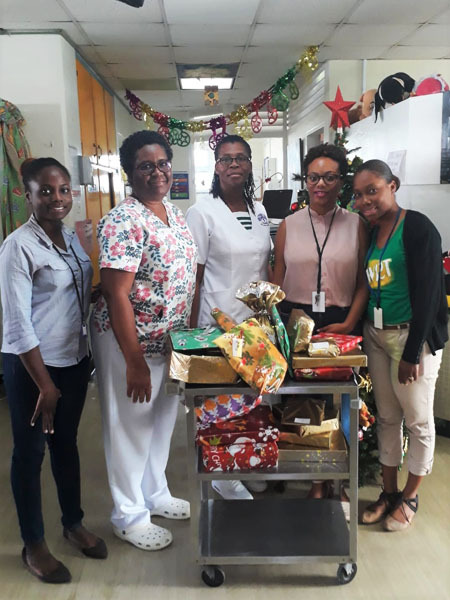 CAP #1: (From left) People Officer, BBBL, Danielle Maughn with NAME and NAME, People Team Member, BBBL, Sherika Jones and People Analyst, Banks Distribution Ltd., Shauntelle Mclean-Barrow during a donation of gifts to the patients of the Queen Elizabeth Hospital.